Staff Sgt. 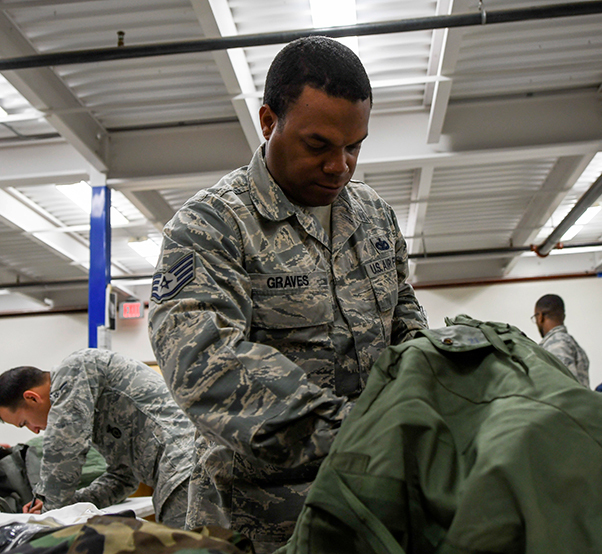 Eugene Graves, 355th Security Forces Squadron defender, prepares his mobility bag during exercise Bushwhacker 19-05 at Davis-Monthan Air Force Base, Ariz., April 2, 2019. Bushwhacker 19-05 is an operational readiness exercise that tested the 355th Wing’s ability to rapidly wield combat airpower to austere and contested locations while balancing flexibility, survivability and lethality in preparation to win the high-end fight. The 355th Wing at Davis-Monthan Air Force Base in Arizona continues to lead the Air Force in high-end operational readiness as it proves the “Dynamic Wing” construct during exercise Bushwhacker 19-05. During the operational readiness exercise, members of the Desert Lightning Team are prepared to rapidly wield combat power, deploy to austere and contested locations around the world and use multi-functional Airmen to establish, sustain and defend the base with organic command and control. 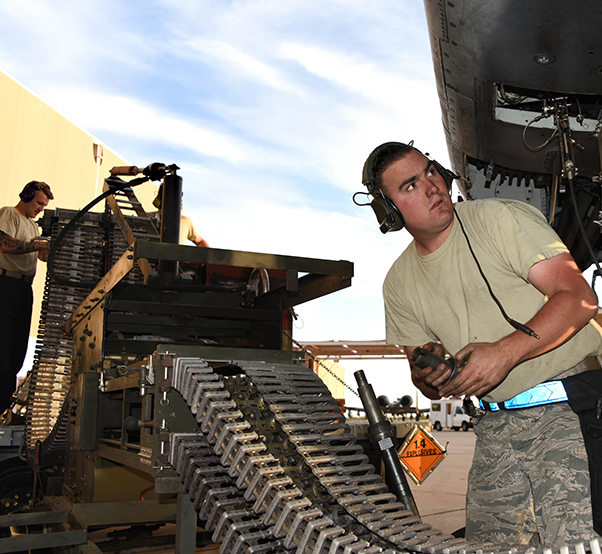 Davis-Monthan AFB is an operational, warfighting base with over 11,000 Airmen that directly support four combatant commanders around the globe every day. Constantly sustaining the ability to destroy the opposition is no small charge. Airmen from the 355th Maintenance Squadron load ammunition into an A-10 Thunderbolt II during exercise Bushwhacker 19-05 at Davis-Monthan Air Force Base, Ariz., April 1, 2019. The operational readiness exercise tested the 355th Wing’s ability to rapidly wield combat airpower to austere and contested locations while balancing flexibility, survivability and lethality in preparation to win the high-end fight. 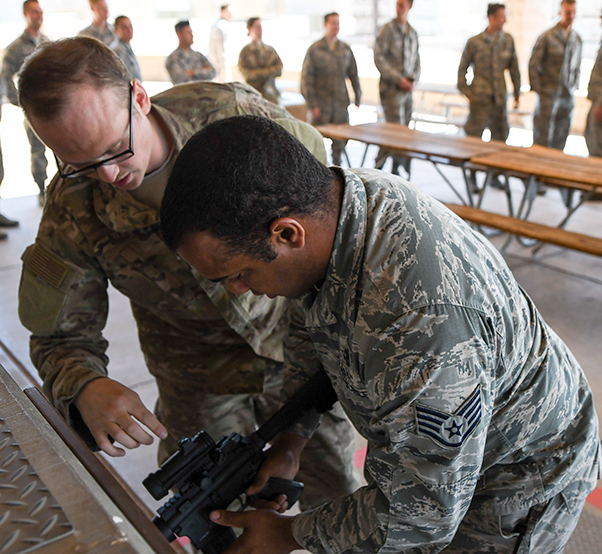 With all the training and preparation occurring during this exercise, Davis-Monthan’s Airmen will be well equipped to handle any situation that comes their way. A U.S. Airman practices clearing an M-4 carbine weapon during exercise Bushwhacker 19-05 at Davis-Monthan Air Force Base, Ariz., April 1, 2019. During the exercise, the 355th Wing practiced wielding rapid combat airpower to austere and contested locations with minimal footprint. As the foundation of the fighting force, the squadrons of the 355th Wing are empowered to take decisive action as they build out the “Dynamic Wing.” From security forces to operations to maintenance, each squadron is critical to mission success. “We will meet the intent of our Air Force leaders to adapt the way we fight in an ever-changing world.” Drowley said. 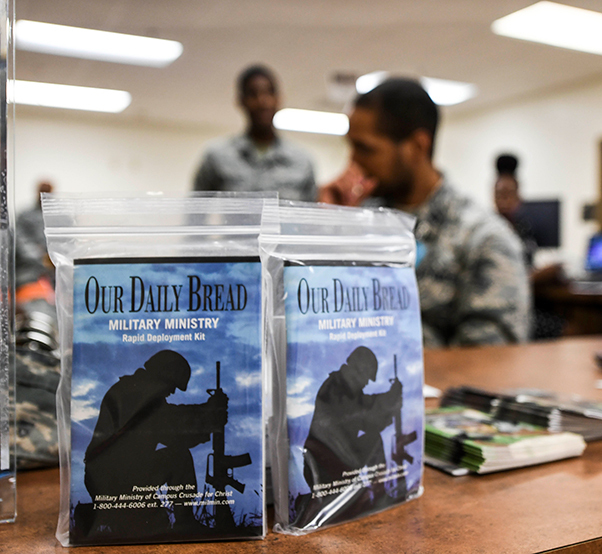 Air Force chaplains display religions literature in the pre-deployment line during exercise Bushwhacker 19-05 at Davis-Monthan Air Force Base, Ariz., April 1, 2019. Military chaplains play a vital role downrange helping to maintain high levels of morale for deployed units among other major responsibilities. 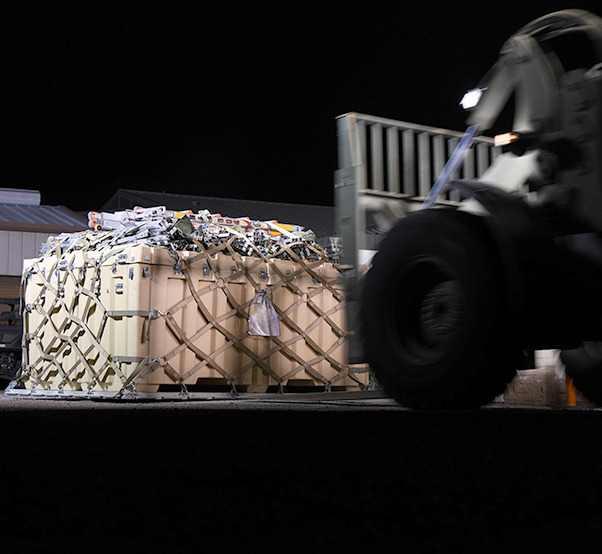 Airmen from the 355th Logistics Readiness Squadron load pallets in preparation for the “Dynamic Wing” construct during exercise Bushwhacker 19-05 at Davis-Monthan Air Force Base, Ariz., April 1, 2019. Bushwhacker 19-05 is an operational readiness exercise that tested the 355th Wing’s ability to rapidly wield combat airpower to austere and contested locations while balancing flexibility, survivability and lethality in preparation to win the high-end fight.